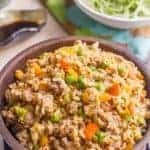 This vegetarian quinoa fried rice is quick and easy to make and loaded with fluffy quinoa and tender veggies. 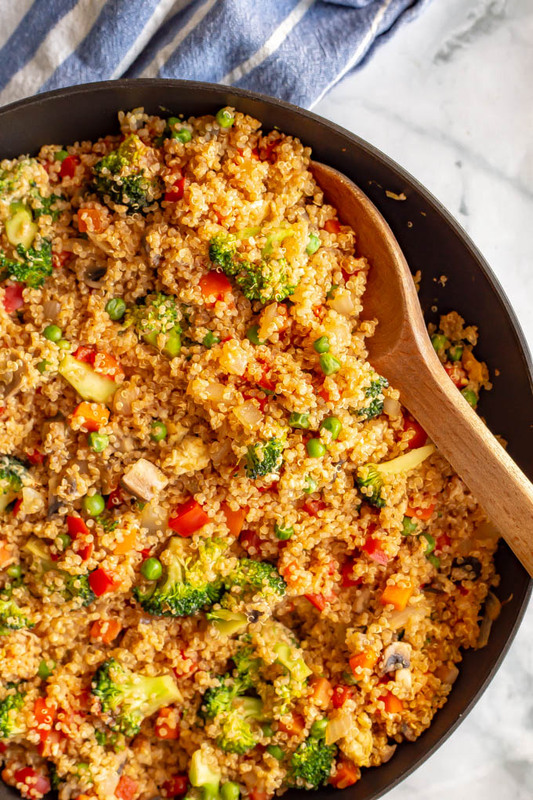 This 20-minute recipe is perfect for a meatless weeknight dinner! Hello friends and welcome to a new week! 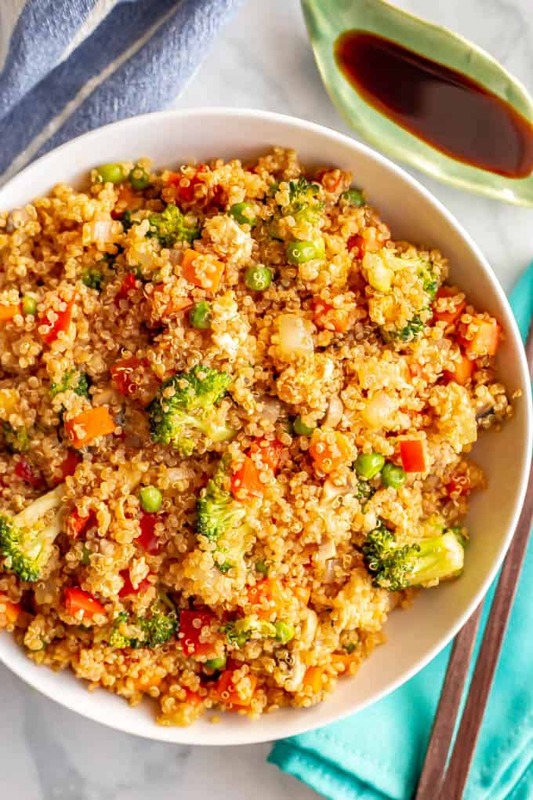 Today’s recipe for this easy vegetarian quinoa fried rice is actually a remake. I had ZERO idea about how to photograph food. Or even use my DSLR camera – the photos weren’t even in focus! Luckily, I’m pretty sure this was one of the recipes I had posted before I ever even told anyone about my blog. I was still trying to figure out how to do everything and was trying to get some content up before I went public with it. So thankfully, probably no one saw the previous version of this recipe. Or those wretched photos. 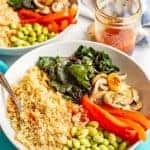 However, I do love this recipe and so I wanted to give it a refresh and share it with you again! 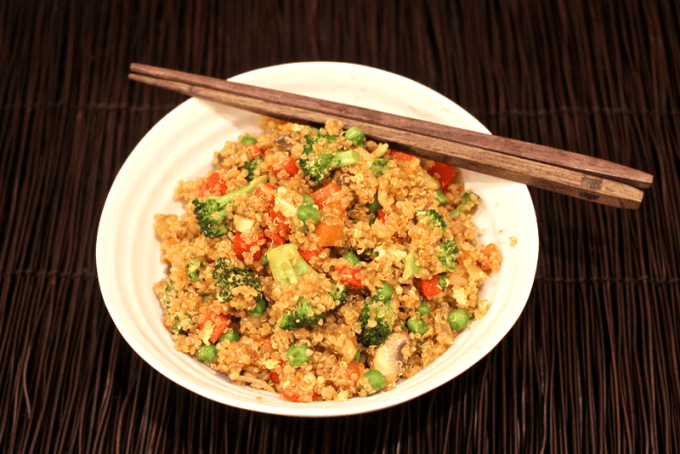 This vegetarian quinoa fried rice is also really quick and easy to make! 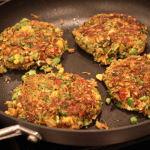 It’s ready in 20 minutes and it is LOADED with veggies! We’ve got onion and red bell pepper, broccoli florets, mushrooms, and peas and carrots. 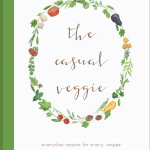 Veggie lovers paradise! It’s also a gluten-free and dairy-free recipe and it can easily be made vegan. 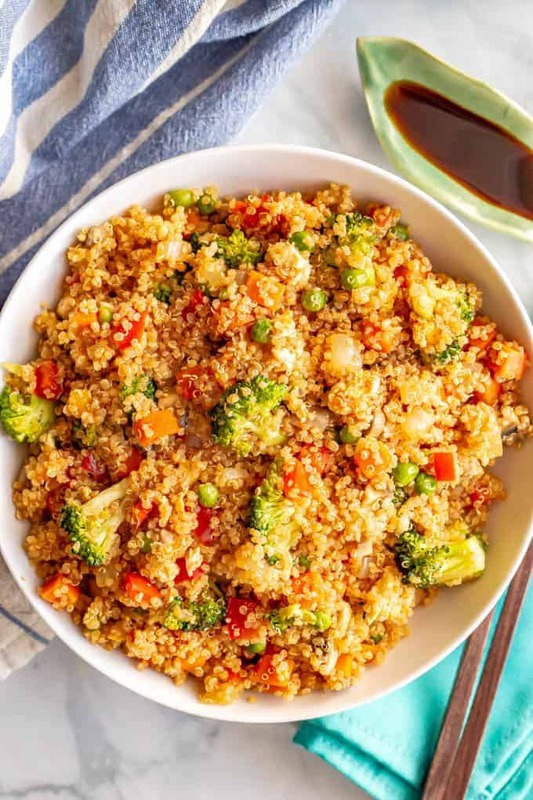 The quinoa here needs to be already cooked when you add it in. 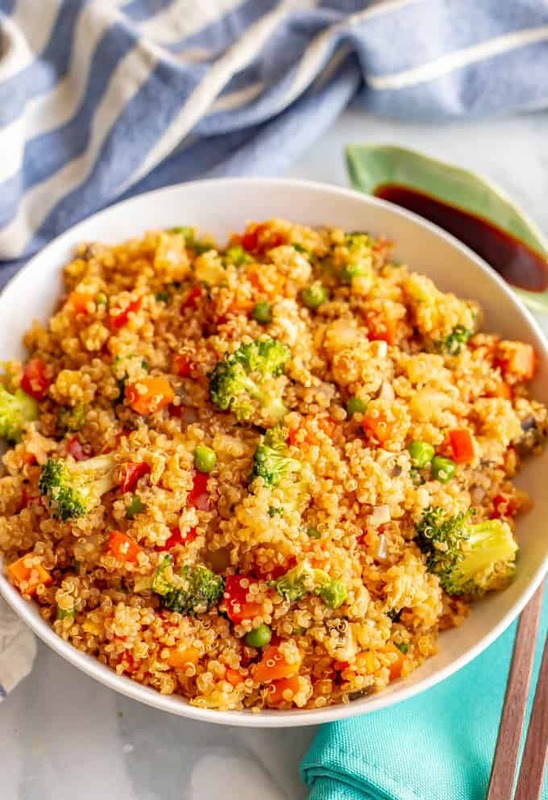 It takes 15 minutes to make, so if you don’t have some on hand already, just cook the quinoa while you’re getting the veggies chopped and the stir fry started. Feel free to adjust the heat on this recipe. I used my favorite Asian chili garlic sauce that’s just got a bit of heat. 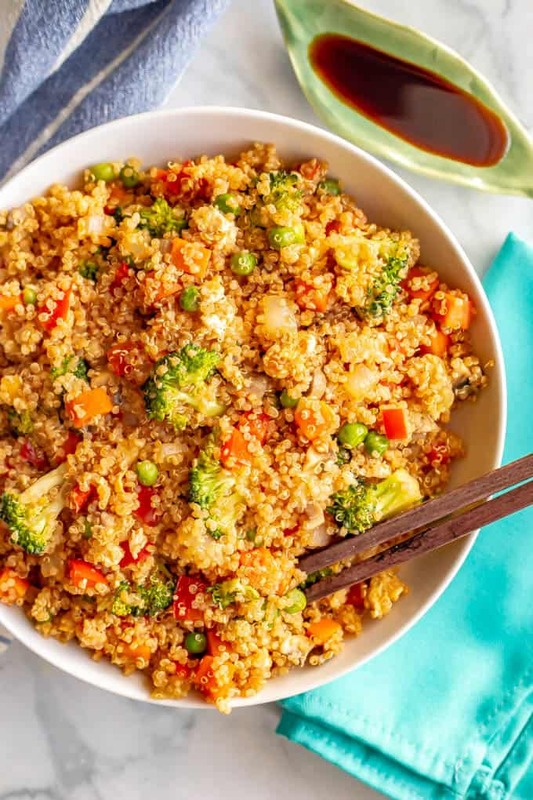 You can add more to make this spicy, or serve it with some sriracha drizzled on top. I’ve also made this with sriracha in place of the chili garlic sauce. It doesn’t have quite the same depth of flavor but it works if you don’t have any of the sauce. 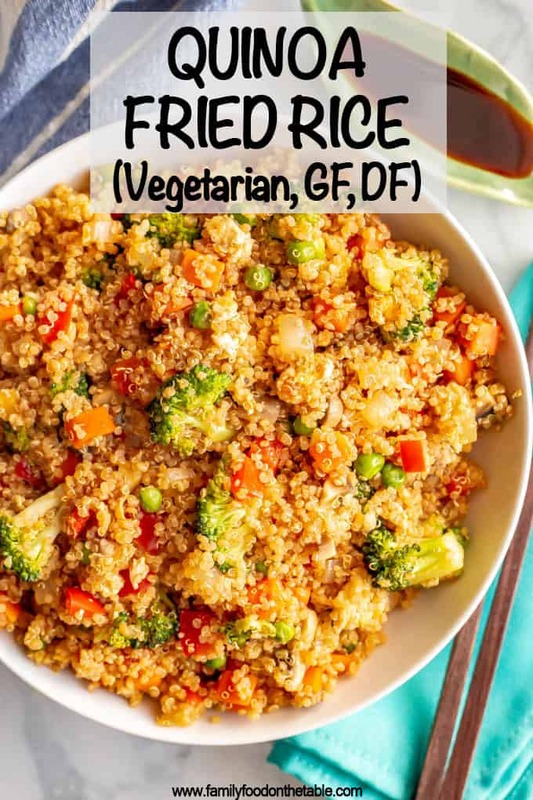 You can omit the eggs in this fried rice if you want this recipe to be vegan. And if you’re gluten free, just substitute tamari for the soy sauce. Not vegetarian? You could definitely add some cooked chicken, pork or shrimp to this recipe if you’d like. 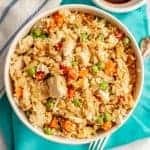 Homemade fried rice, even when it’s really quinoa, is so much easier, faster, more delicious and healthier than takeout. 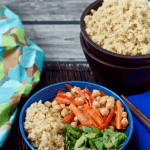 Get to cooking and make this colorful, flavorful dinner! 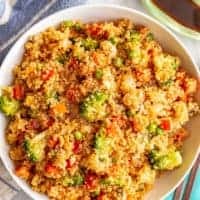 This vegetarian quinoa fried rice is quick and easy to make and loaded with fluffy quinoa and tender veggies. Heat a large wok or sauté pan over medium-high heat and add canola oil. Add onions and red pepper and sauté for 2-3 minutes, until slightly softened. Add broccoli and mushrooms and sauté for another 2-3 minutes, until veggies are beginning to get tender. Add frozen peas and carrots cook for another minute or two, until warmed through. Move the veggies aside and crack the eggs into the pan. Stir to scramble, cook and then mix in with the veggies. 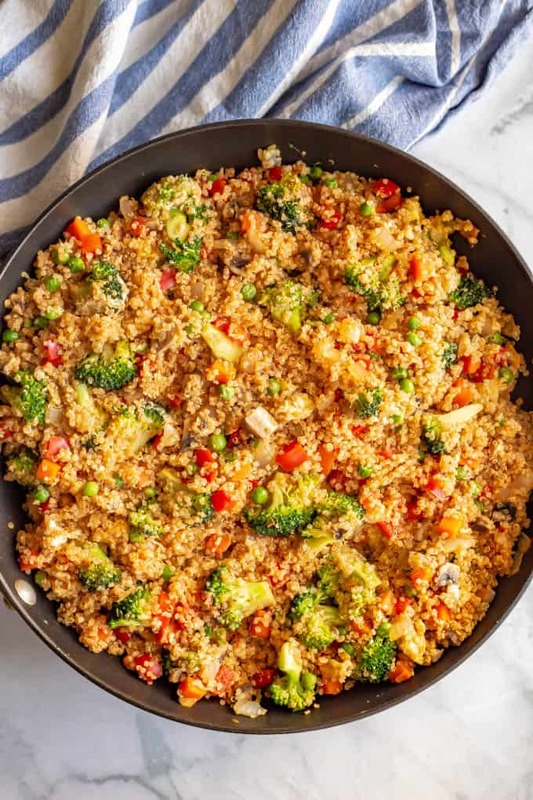 Add the quinoa and mix everything together well. Add soy sauce and chili garlic sauce and stir to combine. Turn off the heat, add the sesame oil and stir to combine. Sprinkle with sesame seeds, if desired, and serve hot. Here’s one of the older photos I promised you. 😳 Feel free to laugh at me!